Carol McCue had never owned a business. A dental hygienist/assistant for 26 years, she had little knowledge of computers or technology. But if there’s one thing she knows, it’s how to make people smile. With her new TapSnap phototainment business, that’s all that matters. “In March, I purchased my TapSnap franchise. In April, I did the training. In May, I’m busier than ever with weddings every weekend,” says Carol. How does TapSnap make people smile? Imagine a giant 42-inch tablet computer where guests at special events and weddings can take their photos simply by tapping their finger on the screen. That’s only the beginning of the fun. They can add digital props like giant sunglasses or Brad Pitt’s head or Iron Man’s mask, and then share their photo creations instantly on social media or through email. 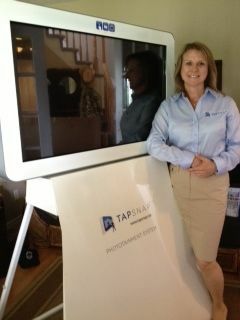 Carol had her first paid event – a wedding – just two weeks after she completed her TapSnap training. On May 1, she cashed her first paycheck and was officially in business. She also recently did an event called National Free Comic Book Day where children in comic book costumes came to local stores with their parents – an absolutely wonderful photo opportunity. For June, she already has grad parties and proms booked, as well as a wedding for 2014. Not bad for Carleton Place, Ontario, a small town of 10,000 people where Carol lives. Located on the outskirts of Ottawa, Canada’s capital city, Carleton Place is a perfect destination for country weddings with idyllic venues like Stonefields Heritage Farm. “Carol McCue is on fire,” says Claire Nagle, TapSnap Head Office Manager. She says the marketing and technical support from TapSnap’s head office has been invaluable – when people google “photo booth Ottawa”, she’s at the top of the list. They’re on call for me at every event. Customers like Adobe and Colautti Group are already approaching her about corporate events such as picnics and corporate Christmas parties. Her favorite moment so far was at a wedding. “Three generations of a family took their photo together – the grandparents, the parents and the grand children. I printed it out and gave it to them and they were so happy. I just really felt pleased to have been there and been a part of helping people make memories,” she says. Because TapSnap events usually take place on evenings and weekends, Carol is able to continue working part-time as a dental hygienist. “It’s being able to have the freedom to set your own schedule, do your own thing. It’s a great way to start something part-time,” she says, noting that she looks forward to her three teenage sons joining her in the business.